Flickr/UK Parliament. Some rights reserved. Rhetorically speaking the 2015 general election was peculiar. Despite the huge issues in play – the Union, the EU, austerity – the campaign was often dull and no argument or slogan ever really took off.People were offered a choice between ‘a long-term economic plan’ and ‘a better plan’. The two main UK-wide parties had rather different platforms yet pretended to be each other: the Tories made unexpected last-minute and uncosted pledges; Labour put itself in handcuffs with a ‘triple lock’ and promised not to spend anything. Despite the carnival of television debates with seven candidates (including two not actually standing for parliament), the overwhelming mood was not that of a joyous celebration of political freedom but one of fear: of the Scots, of Tories, of people from overseas, of economic crisis, of losing the NHS. One of the things good rhetoric does successfully is reduce distance. It brings a speaker and audience members closer together by establishing some kind of common ground. It finds and then builds on shared references and understandings in order to achieve common agreement. But the rhetoric of this election campaign (as of British politics more generally) tended to increase rhetorical distance – promoting division between people and emphasising the individual qualities of party leaders (or lack thereof). Labour politicians in particular have a tendency to overemphasise aspects of their own personality and to make misplaced efforts to declare their ordinariness. As I write, candidates for the leadership of the Labour party are talking a lot about the need to communicate differently, to reconnect with the public and have a new kind of ‘conversation’. Such efforts at reform are welcome – but they will fail without a clear understanding of the value of political rhetoric and of how, in the very new communications landscape we inhabit, it can be employed to bring politics and the public closer together again. A modern time-traveller going back to visit the general election of 1929 would find the arguments of that campaign – between Labour and Conservative, Macdonald and Baldwin – rather familiar. In a public address that opened the campaign, Stanley Baldwin warned his audience that Labour was too close to the unions, too radical, and a risk to both the economy and national security. Ramsay Macdonald replied in a speech the next day arguing that the Conservatives would help the well-off at the expense of ordinary working people, and criticised Tory policy on housing. Not every speech in the campaign was reported in the press. But very often they were summarised in detail, and occasionally they were reproduced verbatim (although the loyalties of The Times, as measured by balance of coverage, were as clear then as they are today). In 2015 no newspaper reprinted any speech in full – although they were available online from a variety of websites. Very few people would have seen one of the party leaders deliver a lengthy speech. There were clips on the news, of course – of fake speeches delivered to handpicked audiences and at events organised precisely to be filmed, edited and broadcast as part of a news package on television. And there were plenty of feature stories intended by party planners to communicate something about the personality and lifestyle of politicians: their kitchens, their kids, their skill at feeding lambs. Eighty-five years ago – in the first election with a full and equal franchise for men and women – an older form of platform oratory was still dominant. 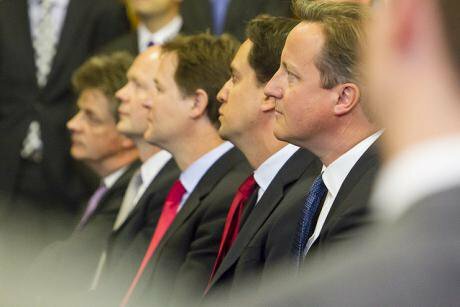 Party leaders spoke to regional audiences and interests – to farmers in Suffolk, miners in Durham. Since then the new technology of amplification that allowed Baldwin to be heard by the thousands on Blackpool beach has become radio and television, though these ‘new’ media create an illusory intimacy while increasing distance. Then, the Conservatives were the first to employ an advertising agency to assist in leaflet design. This time around they hired an Australian campaign and marketing specialist, while Labour paid top dollar for an American one. And the leaders made their appeal to us not by means of public oratory but through the press releases of carefully calibrated pitches that served to widen the gaps between already-fragmented private interests: a cut here, an investment there; a tax break for us, a benefit cap for them. If we understand the organisation of political communication to be a fundamental part of the ‘constitution’ of a country – of how its politics works – then this is a profound change in our constitution. In the course of the 20th century political communication ceased to be primarily a face-to-face, real-time act and became instead a dis-embedded and generic mode of mass communication. This has led to evident changes in the way our politicians make their arguments. Older speeches had longer sentences than do contemporary ones. They are usually better pieces of writing, because their arguments are better unified and the language more freely expressive, where contemporary speeches are often disjointed by comparison. While Baldwin’s oratory was designed to convince and move particular audiences in London, Blackpool and Bury, contemporary speeches are designed to convince journalists to report on them. In the past, leaders’ speeches used to quote sources such as Shakespeare and the Bible (and Labour’s leaders were especially keen on quoting The Times). Today these never feature. Instead we get stories about, and sometimes quotations from, ‘ordinary people’, such as Elizabeth, an auto-electrician, or Colin, a patient in a hospital in Watford, both of whom (unlike the deficit) had a walk-on part in Ed Miliband’s 2014 conference speech. In order to show that they are ‘in touch’, ‘on our level’ – someone who ‘gets it’ – politicians tell us about their personal life, family background and all the people they have met who are ‘like us’. These are attempts to reduce distance that may be well-intentioned but, in their transparency and crudity, are woefully misconceived and often have the opposite effect. Most seriously, they lead to an over-emphasis on rhetorical ‘ethos’ in ways that almost always weaken the argument the speaker intends to make. Rhetoric is an art of public argument – of how, in particular situations, you persuade people to do or support something that you want them to. Typically rhetorical theorists and analysts simplify things by explaining that there are three dimensions to making a persuasive case. These are logos(arguments rooted in some kind of quasi-logical inference from facts or deduction from principles); pathos (arguments built out of our emotions and feelings about things) and ethos (arguments drawing on character). In great rhetoric all three work together, along with apt and effective expression. But in much of contemporary British politics the focus is all on ethos. The appeal to ethos is, in the first instance, the attempt to convince an audience of something by reference to your own character – your authority as an expert, your trustworthiness, your decency. This may make ethos seem rather dubious. After all, evolution is true regardless of how rude Richard Dawkins might be. But in politics, and especially at election time, the kind of ‘character’ we present (of ourselves or of our party) is part of an argument about what is a ‘good’ character and about the sort of attitude that characterises a good governor. This is far from superficial. It’s a profound and difficult question. How do we identify ‘good’ people? Is it by how rich, educated or strong they are? And what would be a ‘good’ person to be in charge in our current situation? Do the times demand a warrior – happy or unhappy – a policy wonk, or a peacemaker? In answering that question – in evaluating the suitability of a certain kind of character for political office or for dealing with a particular issue – we are also making a rather profound and potentially sophisticated judgment about the nature of our current situation. When we decide that our economic situation demands a wise mind, a caring person or someone who can take ‘the tough decisions’, we are also making a decision about how best to understand that situation. Ethos dominated the 2015 campaign – but not in a positive way, and not in harmony with the other forms of argument. Certainly there were ersatz logos-based rhetoric in the form of ‘if … then’ arguments about the terrible things that might happen: ‘If you vote Tory then the NHS will be destroyed’; ‘If you vote SNP then there will be chaos’; ‘If you vote Labour then you’ll be held to ransom by the Scottish’. Significantly, however, the implicit premises of these arguments were not facts about how the world is or how our constitution works or how an economy functions. The premises themselves concerned the character or intentions of other politicians. An argument about who might be most competent to run the economy is not the same as an argument about what such competence might actually consist of. There was an interesting example of the problems of this kind of rhetoric during the televised debate between the five ‘opposition’ parties. Ukip leader Nigel Farage made a series of claims about health tourism. His quasi-logical proposition was (1) that the health service is under-resourced; and (2) that migrants coming to the UK just to use the health service cost it £2 billion; and therefore (3) we should stop immigration and save the health service. Ed Miliband, quite properly, took Farage on. But he did so by reading out quotations from Farage which indicated the latter’s belief in privatisation of the NHS. What Miliband did was directly attack Farage’s ethos. He tried to show that Farage is a liar or inconsistent, or something of that nature. But as a rhetorical argument this fails on two counts. First, it is a misreading of Farage’s ethos. He isn’t trying to appear as a competent, consistent politician, and people do not vote for him for that reason. The attack is misdirected. Second – and even more importantly – it left unchallenged Farage’s wholly spurious claims about health tourism. Anybody watching, no matter how hostile to Ukip, would be left thinking that lots of migrants really do come to the UK just to use the health service, and really do cost the NHS £2 billion. In the end, something rather perverse happened. In theory, ethos ought to help support arguments about particular policies or particular kinds of government, working alongside other forms of appeal. But in reality, in our contemporary British politics, a performance of ethos or character is often not part of an argument for a particular policy or programme at all. On the contrary, policies and programmes are presented as evidence for the good ethos of the party proposing them. In the 2015 campaign, the argument was not ‘the NHS needs a government that cares about it, and here is some evidence that we care’. It was the other way around. Tories promoted policies of supporting the NHS in order to prove that they cared. Labour promoted policies of fiscal restraint as proof of their ethos of responsibility. In this sense the rhetoric was really all about ‘them’ – all about the politicians. In trying so hard to present themselves as good, connected and in-touch, politicians end up talking about themselves and each other in a way that demonstrates just how disconnected they really are. When ‘character’ is integrated into a larger set of emotional and logical claims about policy, an audience is able to make a very important judgment not only about the politician speaking to them but also about themselves. This is because rhetoric is about finding a common ground upon which to engage in communication, and an appeal to ethos works only if the character we perform is recognisable to that audience. The characters of our politicians are, as it were, written in outline by the public: they are a common property made from our shared cultural references. Political actors inhabit them, bringing them to life, giving them a specific inflection and connecting them to issues and problems of the day. It is only when they give themselves up to this that politicians have a chance of becoming leaders. In an election, when choosing between more than one such character, the electorate chooses which parts of its cultural repertoire it wants to bring to the fore. It is making an ‘ethical’ decision about its disposition towards the world. But when the argument becomes concentrated on the individualised character of parties and leaders – who is too weird, who is too posh – the important argument about who we are collectively becomes misplaced. At that point it is no longer an argument about us, and so people feel correspondingly distanced from those characters. This, of course, is a situation which – to the extent that it is good for anybody – favours Conservatives, since it favours individualisation and ‘anti-politics’ sentiment. It is not easy to do change this. Leaders of the UK-wide mainstream parties have to appeal if not to everyone, then at least to a large and wide cross-section of the public. That audience (in some ways much more so than in 1929) is made up of people from all sorts of backgrounds and with very varied experiences and outlooks. It is also hidden. Standing at a farmers’ meeting in Suffolk, Stanley Baldwin knew to whom he was speaking and what to speak about. Today, on broadcast media, you don’t know who is listening. Indeed, you can’t be sure even when speaking at a private meeting: anything can be taped, leaked or tweeted, and held against you. This is one reason many professional mainstream politicians tend to play it safe, repeating bland phrases and saying not very much at all. It’s also why people (and not just journalists) are excited by someone, anyone, who breaks this mould – a Sturgeon, a Farage, a Boris Johnson. Each in their own way embodies the politics they promote and establishes a connection between their ethos and the sort of country they want to create. (Sturgeon in particular does this brilliantly: compare her speech on taking up the position of first minister – the way she weaves her personal experience into a larger argument – with the way too many Labour politicians drop in disconnected references to their character.) Each also represents a break with the cautious, defensive Westminster style, and with the way in which so many politicians seem to disown their own words even as they say them. Each rides out challenges to their personal ethos by connecting their persona and style to a consistent politics with which people are invited to identify. The problems here are not all rhetorical. The distance between public and politician has been widened by atrophy in the social institutions that connect people to politicians: trade unions, the churches, town and parish councils, the regional press, and of course political parties themselves. But things are changing. The mass communication of 20th-century politics is not yet quite dead, but it will be soon. The many and varied forms of online communication are already creating new kinds of political community and constituency and a new kind of political culture that expects minimal distance between leader and the led – and, often, an impossible kind of immediacy. The new politics to which this will give rise can be glimpsed in the kind of mobilisations one finds around the SNP, Ukip and the Greens in the UK, Podemos in Spain, Syriza in Greece and presidential candidate Bernie Sanders in the United States. Not all of these will win power but they are having influence – in part through a rhetoric which breaks with the crude postures of the ‘professional’ politician and which re-embeds ethos within a relationship between party and people and within a broader series of arguments about who we might yet become. The politicians who fail to understand this – no matter how many ‘ordinary people’ they talk about meeting, and no matter how carefully calibrated their ‘offer’ to this or that demographic – will be consigned to history. This article was originally published here by the Institute for Public Policy Research.